Long-Term Care solutions are top-of-mind for many people today. What started as a basic offering some years back has morphed into a bevy of viable options available today. Short further back story: In Ancient Rome, a child surviving to age 10 could expect to live another 37.5 years for a total life expectancy of 47.5 years. Fast forward to 2015, in my United States, a 10-year old can expect to live about another 70 years for a total life expectancy of 80. Few would argue that people are living longer now than ever before. Short back story: As people started to live longer in the United States, the elder care industry evolved from what once consisted of only Nursing Homes to a broader array of services including at home care and assisted living facilities. Paying for service was a different problem as health care insurances wanted none of it – enter Long-Term Care Insurance. The first policies were written in the 1970s, though it was a sideshow. As the need for Long-Term Care rose and people shuddered at the idea of having to sell their home and fork it over to a nursing home, Long-Term Care Insurance became a new insurance business line. The problem, unforeseen at the time, was inaccurate underwriting due to assumptions based on 1970-like longevity estimates and unanticipated medical cost increases. This led to financial disaster for many Long-Term Care insurers and seriously impacted their policyholders, either through unfulfilled promises (coverage) or steep rate increases. Today’s Situation: Recognizing errors of the past, Long-Term Care Insurance is still offered, though with serious governors to cap benefits – more on that later. Additionally, the insurance industry has dreamed up many other options to address Long-Term Care needs. 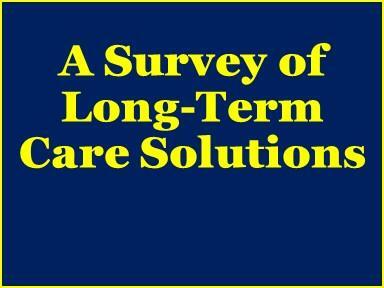 Bottom line: there are many options individuals can pursue to address the need for Long-Term Care. Activities of Daily Living: there are 6 of them - eating, bathing, getting dressed, toileting, transferring and continence. Typically, you must be unable to perform 2 of the 6 to qualify for Long Term Care coverage. Benefit Period. The maximum period an individual can receive benefits after a qualifying long-term care event. Elimination (or Waiting) Period. Think of this as the deductible. It is the length of time an individual must pay for covered services before insurance kicks in. Guaranteed Renewable Policy. The company guarantees the insured may renew the policy for life, as long as premiums are paid. Lifetime Maximum Benefit. The maximum amount a long-term care insurance company will pay for all covered expenses throughout the life of a policy. Maximum Daily Benefit. The pre-set amount a long-term care insurance policy will pay for each day during a claim period. Maximum Benefit Period. The amount of time a long-term care insurance policyholder will be able to collect benefits for a qualified long-term care event. There are other relevant terms, though that small set is enough to get you started. Now on to the options for Long-Term Care needs. Medicaid. For some, the confluence of income, expenses, savings, and Long Term Care needs results in turning to the government as their Long-Term Care solution. There are also others looking to transfer assets to family members and then seeking public assistance for Long-Term Care…I do not recommend this strategy as I do not want to rely on changeable laws and governmental regulations to provide for my Clients' well-being. Self-Funding. Some individuals have enough wealth to stomach whatever life throws at them. For those lucky ones, Long-Term Care coverage is a snap. I would suggest a number, though I fear any number could be harshly criticized. Insurance Products. For those falling between the extremes of wealth, a bevy of options exist to address long-term care needs. These options are the focus of the remainder of the article. With this option, an individual applies for coverage through either a specific or general insurance agent and then goes through underwriting for coverage determination. From experience, underwriting is somewhat draconian in that companies can deny coverage for pre-existing conditions. A specific example is osteoporosis. Counter-intuitively, some conditions may not jeopardize coverage. For example, blood pressure or cholesterol issues that are controlled by medication may not disqualify an applicant. Remember, for Long-Term Care coverage, insurance companies are concerned about longevity. Thus, gals tend to pay more than guys for the same coverage. Male, 67 years old at initial coverage; 90-Day Elimination Period; $150 Daily Benefit; 3-Year Benefit Period; Maximum Benefit of $164,250, and a 4% Inflation Rider netted a premium of $233 per month. Individual results may vary widely. Reasons to consider this coverage: If you are otherwise under-saved, yet you have significant retirement income from the combination of social security and other pension income, then this option may be of interest to you. One group to whom this specifically applies are military retirees, who have generous inflation-adjusted pensions. Other groups such as retired Airline Pilots or municipal workers may also want to consider this option. Things to watch: The initial premium is not guaranteed for life. Rather, policies are typically guaranteed renewable, which means once you have coverage, you can keep it, though your rates can go up. Indeed, clients of mine who had a Met Life policy saw their premium increase over 30% recently. Another issue to consider is you may pay for coverage and never use it. That said, giving up some near-term lifestyle by way of reduced monthly spending to pay Long-Term Care premiums is a pill those using this strategy must unfortunately swallow. This is a novel wrinkle to traditional Long-Term Care coverage where a married couple applies for Long-Term Care insurance together and goes through separate underwriting. Then, the insurance company provides individual quotes, each with a Shared Care Rider enabling any unused portion of coverage to transfer to the surviving spouse, who keeps the same individual premium. Real world example: Husband 64, Wife 63, 90-Day Elimination Period, $100 per day benefit (for each), 3% Inflation Rider, Policy Limit 3 Years, Maximum Payout $216,000 netted the Husband a Monthly Premium of $107 and the Wife $152. Reasons to consider this coverage: For those seeking to increase the odds of having “some” payback from the premiums, this may strategy may make sense as the likelihood at least one person in a married couple are higher than for an individual. Additionally, if one spouse does not anticipate a Long-Term Care need (imagine your own scenarios) while the other expects a good bit of longevity, this strategy may make a lot of sense. Since the survivor receives a credit for any unused benefit, you can look at this type of policy as a way to extend benefits for the longer-lived spouse while hedging things a bit by making coverage available to both people. Things to watch: The Shared Care benefit is not uniform among providers, so a careful read of the fine print is essential. These policies share the same shortcomings of a Traditional Long-Term Care Policy noted above, i.e. Premium Increases. With this option, an individual applies for a life insurance policy. As part of the coverage, the insurance company includes, for an increased premium, a long-term care rider that allows the individual to draw on the death benefit after a triggering event such as an inability to perform 2 of the 6 ADLs. Underwriting is about the same as for a Long-Term Care policy. Male, 45 years old at Initial Coverage, $450,000 Insurance Coverage, 90-day Long-Term Care Elimination Period, Maximum Long-Term Care Coverage of $450,000, Maximum Monthly Benefit is $10,800 with no Inflation Rider netted a premium of $321.67 per month. Reasons to consider this coverage: This type of coverage is essentially a Long-Term Care policy with a Death Benefit rider. Meaning, for those looking for Long-Term Care Coverage, though you are loath to pay premiums for which you may never see insurance coverage, this may be something to investigate further. On the face of it, $450,000 is typically a low amount of life insurance coverage for those requiring it, so an additional policy may be needed. With this type of policy, the premiums remain the same, which may also appeal to some. Things to watch: With no inflation protection, this strategy ought to be coupled with other revenue streams if a considerable amount of time will lapse between coverage and anticipated Long-Term Care needs. Meaning, 4% inflation applied over this individual’s life may result in $10,800 in 35 years looking like about $2,700 today – decent coverage for sure, though more cash may be needed for the desired level of care. With this option, both spouses in a married couple apply for a regular Whole Life (Permanent) Insurance Second-to-Die policy. They go through the same underwriting process as previously described. If approved, they are both covered by a second-to-die Life Insurance policy with a guaranteed death benefit of $125,000 (this can be increased). Also, they pay only 10 annual premiums on the policy. Then, no more premiums are required. The wrinkle in this product lies in the Long-Term Care Benefits. If there is a Long-Term Care triggering event, either the husband or wife can draw on the death benefit – at a rate of $5,000 per month in this example up to the face amount of the policy. Then, once the death benefit is exhausted, either member receives the same $5,000 per month for an unlimited period. If both spouses pass away without a Long-Term Care need, the Death Benefit is paid to their beneficiaries as with any other life insurance policy. Real world example: Married couple ages 50 and 47. $125,000 Whole Life Second-to-Die Policy with the same terms for payout as described above. All this equated to 10 equal premiums of $7,732. Reasons to consider this coverage: For current high-income earners who anticipate a big drop-off in earnings once work stops (think Doctors, Lawyers, and Business Owners), this strategy ought to be strongly considered. Basically, you pay the high premiums while you are working and then stop when you retire and start living off your savings. Moreover, if you anticipate a long period of in-home care for either spouse (think Alzheimer’s Disease), then the extended period of coverage may be of value to you. Things to watch: The payouts this type of policy provides are unlikely to cover ALL Long-Term Care expenses. Therefore, you ought to anticipate coupling this with other income sources (Social Security and savings) to meet the individual needs. While it is possible to purchase inflation protection with this type of policy, that rider can be quite costly to the point of being self-defeating. Finally, utilizers of this strategy ought to be reasonably sure sufficient funds will be currently available for the full 10 years of premium payments. This article is not intended to be an all-inclusive single source document about Long Term Care Insurance. Rather, I am simply trying to point out a little bit of the playbook to consider when addressing Long-Term Care needs. I admit, the realities of Long-Term Care are sobering: longer life spans, better medical treatments, rapidly increasing health care costs…it is not an altogether pretty picture financially speaking. However, ignoring the fact that we are increasingly likely to need Long Term Care is not a wise planning choice. In military terms, hope is not a valid plan. In the end, there are factors we can control and those we cannot control. I am 100% positive I will have zero impact on the cost-inflation that permeates our health care industry, so I don’t waste a lot of time on it. What I can control – my savings, my spending, and organizing a Long-Term Care solution so I will have the resources necessary to provide a level of care with which I am comfortable…I can control those things. And it is empowering when I do the same for my Clients, since they can spend their retirements on intended things instead of sweating Long-Term Care potentialities. The ideal situation is to already have a Long-Term Care plan in place. If you don’t, perhaps this article suggested some ways you may start to thinking about solutions.